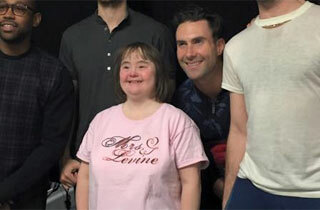 All it takes these days to meet a celebrity is a well-run social media campaign, as this 50-year-old woman with Down’s syndrome learned when her friends began a Facebook drive to help her meet Maroon 5. Leslie (last name unknown) had a dream, and that dream was to meet Adam Levine, the band’s frontman and a coach on NBC’s The Voice. So her friends made it happen, and 2,508 Likes later, it came true when the band performed in Boston’s TD Garden last night. Post by Leslie Wants to Meet Adam Levine. The meet-up comes on the heels of another Adam Levine wish-making move for a 10-year-old boy with Down’s syndrome. In that encounter, the sight of Levine caused a panic attack in young Christopher Walker, who was immediately calmed down by his rock music idol. Video of that situation went viral, causing millions to rethink their skepticism of the adult contemporary rock musician.